The Junkers Ju 87 or Stuka (from Sturzkampfflugzeug, “dive bomber”) was a German dive bomber and ground-attack aircraft. Designed by Hermann Pohlmann, it first flew in 1935. 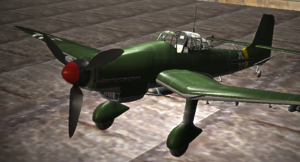 The Ju 87 made its combat debut in 1937 with the Luftwaffe’s Condor Legion during the Spanish Civil War and served the Axis forces in World War II.